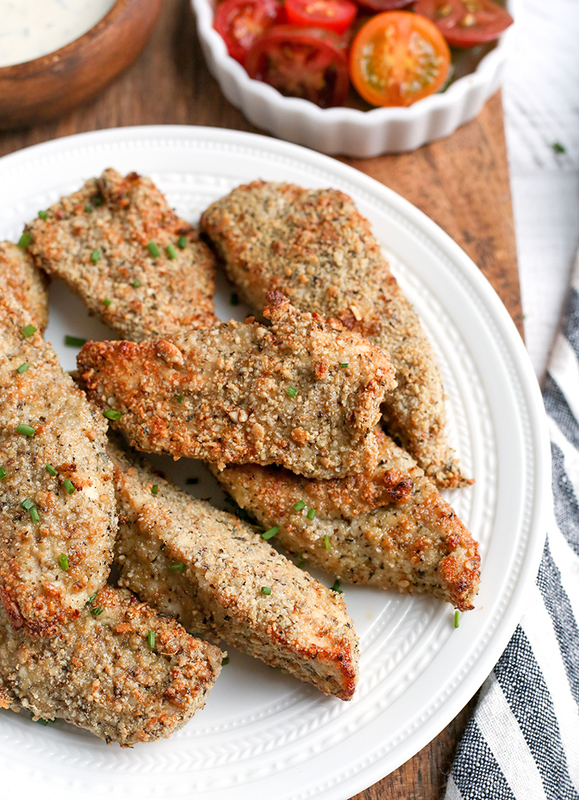 This Paleo Whole30 Air Fryer Breaded Chicken tastes amazing, is crispy, and healthy. 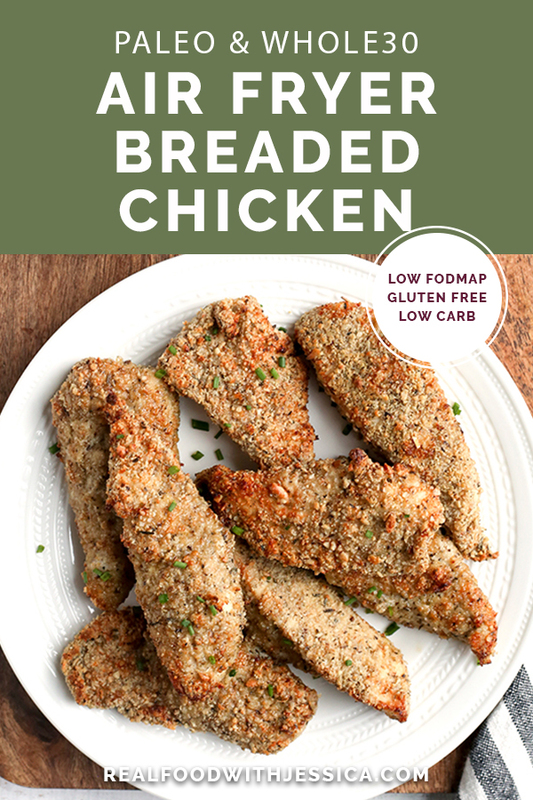 Gluten free, dairy free, nut free, egg free, low carb, and low FODMAP. So I’ve had the air fryer a couple months now and I just got around to making chicken. 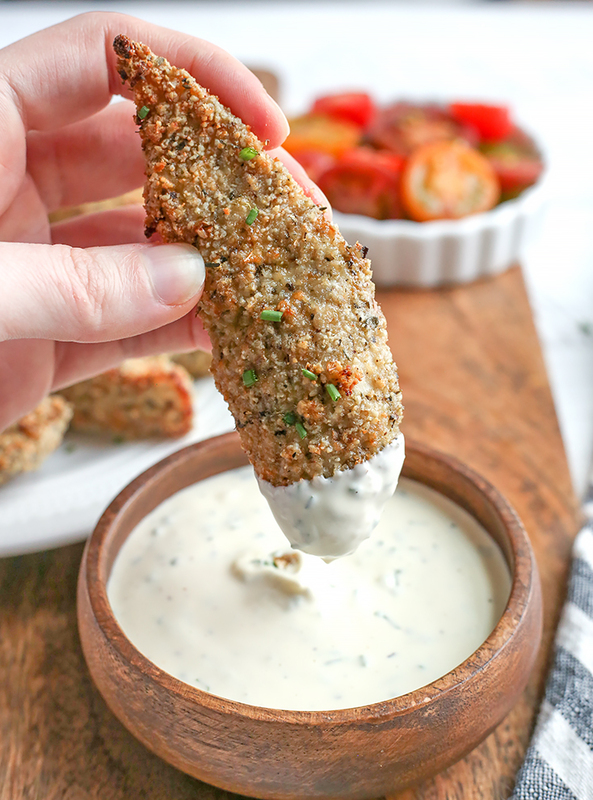 I knew I couldn’t make my Paleo Chicken Tenders because I can’t tolerate almond flour right now so I needed an alternative coating. I decided to try sunflower seed flour- I took raw sunflower seeds and blended them quickly until they were the consistency of flour. Then I added some seasonings and they came out better then I hoped. They are amazing! You can’t taste the sunflower seeds at all. I actually just looked on Amazon and apparently they sell sunflower seed flour in case you don’t have a blender. It is way cheaper to make yourself though! Since I made them nut free I decided to also make them egg free. Instead of a egg coating before the flour coating, I did garlic oil. Just a little rubbed on the chicken and it helps keep the flour in place and adds lots of flavor. If you don’t need these to be low FODMAP so maybe you don’t have garlic oil, then you can use avocado oil. 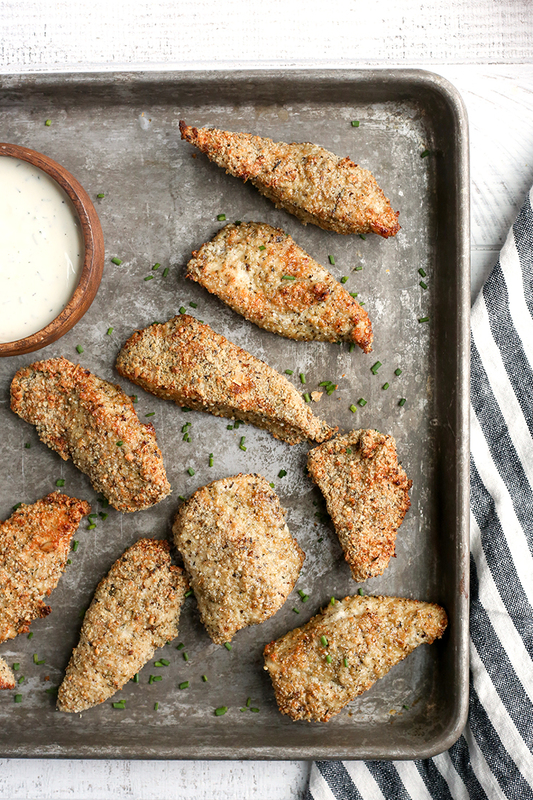 I love cooking these in the air fryer because there is minimal preheat time and they are done in just 10-12 minutes. So easy! I’m sure you can bake them if you don’t have an air fryer. This chicken is juicy with a crunchy, flavorful coating. Note that these are crunchy, but not like true deep fried chicken. I think you will still be happy with the results. 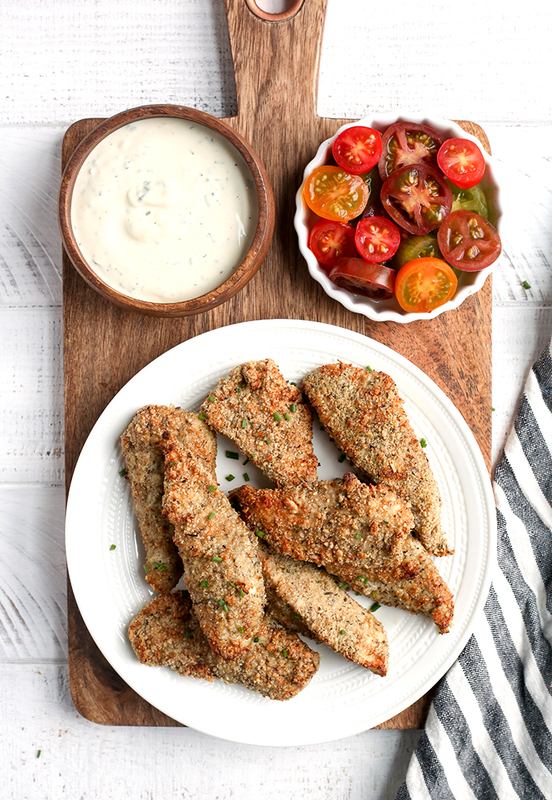 To rewarm, cook for 3 minutes again in the air fryer for best texture. 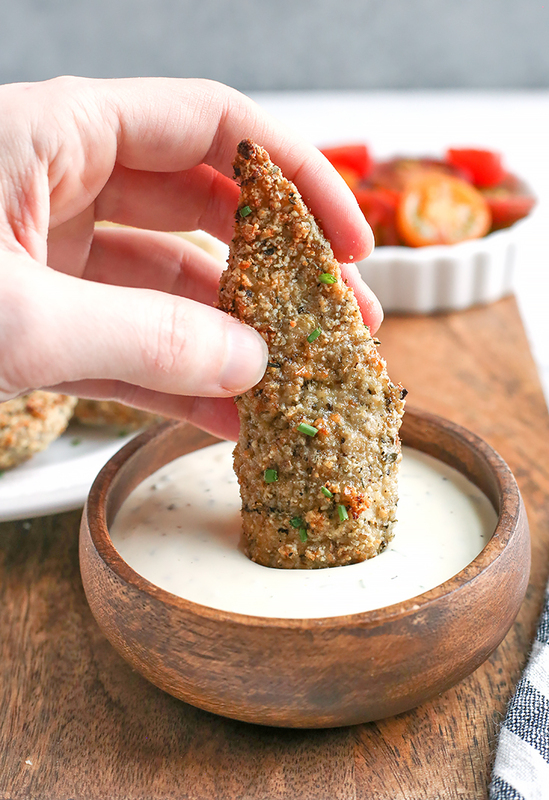 I highly recommend dipping the in Paleo Low FODMAP Ranch Dressing. Yum! 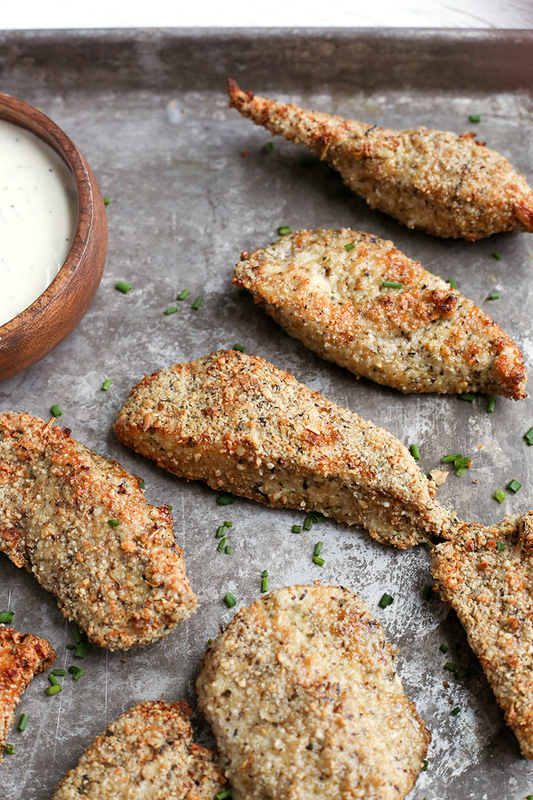 I think you will love this chicken because it’s quick, easy and so delicious! HERE is the air fryer I have and love. It doesn’t have an non-stick coating which is important. Combine the sunflower seed flour, salt, and Italian seasoning in a shallow bowl. Turn the air fryer on to 375° and remove the wire rack (if using the Cuisinart one). Coat the chicken with the oil and dip it in the flour mixture, pressing onto the chicken to coat evenly. Place on the wire rack, spray with a little 100% avocado oil if you have it. Cook for 6 minutes, flip and then cook for 4 more minutes. If there are thicker pieces, remove the smaller ones and let the thicker ones cook for an additional 2 minutes. Reheat leftovers by cooking them in the air fryer for 3 minutes at 375°. *I linked to one you can buy, but it is way cheaper to just make your own with sunflower seeds in a blender or food processor. Use raw sunflower seeds and blend until flour consistency, it should take under a minute. **Make sure the Italian seasoning doesn't have onion or garlic. The one I linked doesn't.